The amount of variety in the insect world is amazing – although maybe not so amazing after all, when you consider that beetles alone probably account for a quarter of all known species of animal. They’re capable of all sorts of feats of physical endeavour and endurance. This entertaining and informative book separates the truth from the myths – including in some cases where truth is even stranger than fiction. Could cockroaches really survive a nuclear winter? Did the Australians really have to introduce dung beetles to cope with all the mess of the cattle they’d imported earlier? Do earwigs really find their way into your middle ear? And should we be scared of dragonflies as the Europeans believe, or admire them, as the Japanese do? There’s no getting away from the dark side of insects, though. You’ll find out about the most dangerous animal on Earth. You’ll read about the insect that mutilates and enslaves other insects. And the femme fatale that lures her cousins’ lovers to their deaths. Naturally, we’ve stuck to the well-established Ergo Guides tradition of giving you 102 facts for the price of 101. 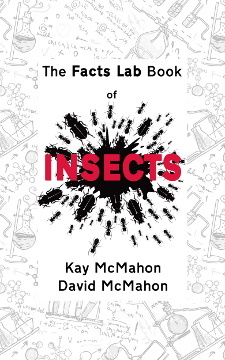 The Facts Lab Book of Insects is a great springboard for you to launch yourself into the fascinating world of insects. Read it, and you might find yourself pausing before you squash that next bug. You can buy this book through any local version of the Kindle Store. For your convenience, we've provided links to all of them. If you have the time, we'd appreciate it if you could rate or review the book on Amazon too - it's always good to have feedback. Thanks! Don't worry, you don't need one. There are several Kindle reader programs, plugins and apps available at Amazon that cover most computers and smartphones. This entry was posted in Trivia by Ergo Guides. Bookmark the permalink.